In October 2003, I was driving around Guatemala, looking for plants, animals, old cities, and archaeological sites. 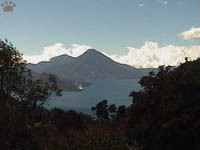 It is the most interesting place in Central America in terms of cultural and biological diversity. Street vendor, Antigua. Thousands of tourists visit Guatemala, but very few of them ever stray away from the "tourist traps" of Antigua, Lago Atitlan, and (for the more adventurous ones) Tikal. True, it is not the easiest country to travel in, but I found that it no longer fits the stereotype of thoroughly corrupt and dangerous "banana republic". I actually had more problems with corrupt police in supposedly civilized Belize and parts of Mexico. Maya temples in the rainforest, Tikal. As in many other countries, "touristic" parks and reserves are well-protected, while most of the land between them is being rapidly deforested by the exploding population. 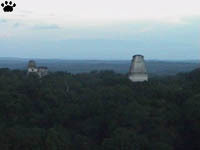 View from a temple, Tikal. 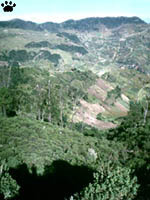 Deforested highlands, Guatemala. Thanks in part to the Catholic Church, population in El Salvador and some parts of Guatemala has grown sixfold in the last 50 years. 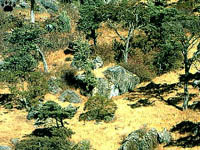 As a result, all natural vegetation is gone from much of the land, especially in the heavily populated highlands. Highlands, but now little remains of them. 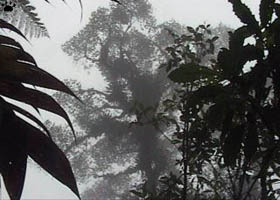 Cloud forests have suffered the most. They are mostly made up of oaks, highly valued for timber, so most of them have been logged and converted to fields, pastures or secondary growth. now deforested all the way to the summit. 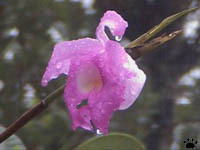 Cloud forest orchid, Guatemala. This is very unfortunate, because cloud forests harbor much of the regional biodiversity, including thousands of endemic species, from huge horned guans (Oreophasis derbianus) to tiny fungae, mites, and targidrates. Cones of Lusitania cypress. 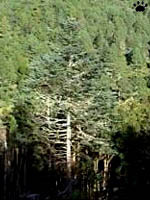 There are considerable reforestation efforts in the region, but they mostly create open forests of various pines and Lusitania cypress (Cypressus lusitanicus), not suitable for most of local plants and animals. Birds of cloud forests are notoriously difficult to photograph. Left to right: yellow-winged tanager (Thraupis abbas), blue-crowned chlorophonia (Chlorophonia occipitalis), pink-headed warbler (Ergaticus versicolor), emerald toucanet (Aulacorhynchus prasinus, 3 photos). 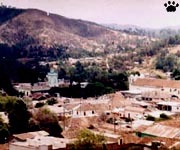 Cuchumatanes. 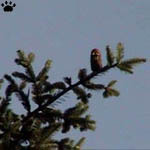 As for various environmental organizations, they mostly care about birds and large mammals, while all the small things like shrews, or insects, or mosses, don't get much attention, and quietly slide towards extinction. For example, many endemic salamanders of Guatemala and Southern Mexico haven't been seen since the early 20th century, in part because nobody bothered to check on them and see if they needed protection. Some are probably extinct by now. 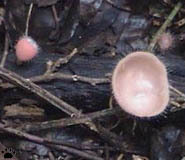 Spiny pocket mice of Guatemala, left to right: Liomys salvini (2 photos), Heteromys desmarestianus. Villa Luz, Chiapas. One such unappreciated and unprotected group is rodents. 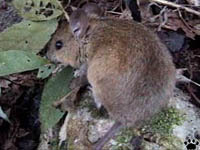 Nine species are endemic to the mountains of Guatemala and adjacent Chiapas, Mexico, including two species of deer mice (Peromyscus) shown here. Harvest mice of Guatemalan mountains, left to right: Reithrodontomys fulvescens, R. sumichrasti, R. tenuirostris. Monte Alban, Oaxaca. 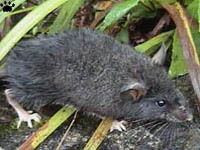 The rarest and most local of them all is Maya mouse (Peromyscus mayensis), known only from a tiny area in Sierra de los Cuchumatanes in western Guatemala, above the town of San Mateo Ixtatan. Deer mice of Guatemala and Southern Mexico, left to right: P. stirtoni, P. aztecus, P. leucopus, P. melanophrys. 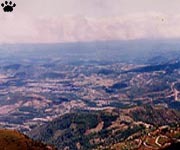 Sierra de los Cuchumatanes. Sierra de los Cuchumatanes is a high plateau, not unlike the Altiplano of South America. 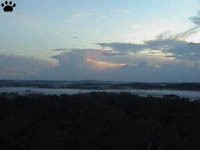 The plateau itself has only scattered trees, but the outer slopes used to be covered with lush cloud forests. Plateau vegetation, Sierra de los Cuchumatanes. 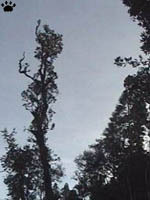 Plants, Sierra de losCuchumatanes. Millipede, Sierra de los Cuchumatanes. 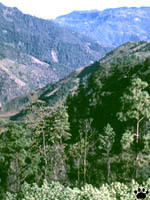 Sierra de los Cuchumatanes. Unfortunately, these forests are now mostly replaced with fields, pastures, and secondary pine forests. The rarest forest type is also the only one that Maya mouse can live in: tall oak-dominated forest with a thick layer of dead leaves on the ground. 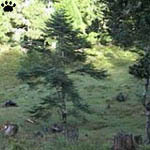 Such forests only existed in an extremely narrow elevation range, at 2900-2950 m (9670-9830'). I spent a few days looking for them, but found only scattered oak trees and lots of fresh stumps. 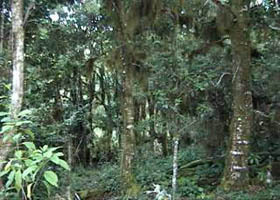 My forest, Sierra de los Cuchumatanes. My largest oak, Sierra de los Cuchumatanes. 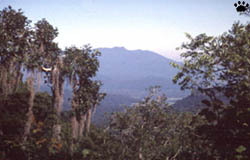 Sierra de los Cuchumatanes. Finally, I found a tiny patch of cloud forest, 50x20 m (170x65') in size, on a very steep slope at just the right altitude. It was in process of being logged for firewood, but one large and a few medium-size oaks were still standing. After four hours of bargain, I convinced the landowner to sell me the forest for US$100, registration tax and fencing included. I was unemployed at the moment and didn't have any spare money, but I just couldn't stand there and watch that last little grove being destroyed. My mushrooms, Sierra de los Cuchumatanes. 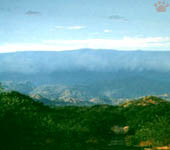 clearcut, Sierra de los Cuchumatanes. 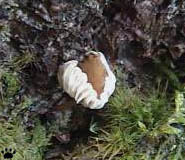 In addition to epyphyte-covered oaks, the forest had at least ten other tree species, including a few very rare Guatemalan firs (Abies guatemalensis), and an outstanding variety of other plants, fungi, birds, insects, millipedes, and snails. It was hard to believe that so much diversity could be packed in such a tiny area. 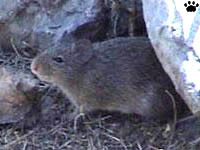 Rodents of Sierra de los Cuchumatanes, left to right: Habromys lophurus (2 photos), P. mexicanus. pictus pocket mouse. The main question, of course, was whether Maya mice lived in the forest or not. I had to spend a few very cold nights searching the place. I also set a few live traps, and checked them every two hours to make sure the trapped rodents didn't get cold in there. 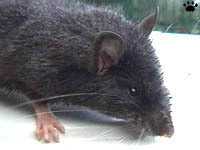 Trapping was necessary, because 100% certain identification of rodents is often possible only in the hand. 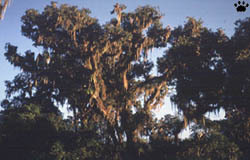 This species is partly arboreal. Live-trapped rodents of Mexico and Guatemala, left to right: deer mouse P. guatemalensis, woodrat Neotoma mexicana, vole Microtus quasiater. 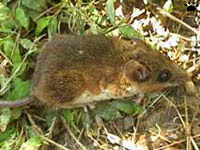 Maya mouse, Sierra de los Cuchumatanes. almost certainly less than 20. And, believe it or not, I found it! 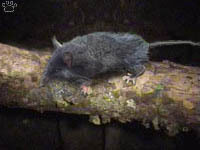 It is a weird creature, looking more like a shrew than a mouse, probably because it is mostly insectivorous. 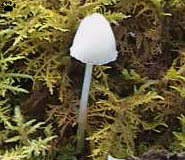 It is almost black, and can be very difficult to locate at night even in such a small area as my forest. to move along rotting logs and fallen trees. Birds of Sierra de los Cuchumatanes, left to right: chestnut-capped brush-finch (Atlapetes brunneinucha), brown-backed solitaire (Myadestes obscurus), golden-browed warbler (Basiletereus belli, 3 photos), rufous-capped warbler (B. rufifrons). 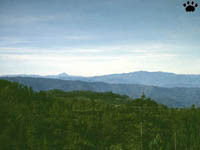 Sierra de los Cuchumatanes. It's been known since the 1960-s that Maya mouse was in danger. But, being a small unpopular animal, it wasn't formally listed as endangered or threatened until a few years ago (not that it would've changed anything). Sierra de los Cuchumatanes is supposed to be a Nature reserve, but there's no actual protection. View from my forest, Sierra de los Cuchumatanes. 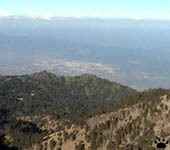 Sierra de los Cuchumatanes. All that stands between this creature and extinction is a bunch of "private property protected by landmines" signs I've posted, and the honesty of the owner of the surrounding land. The forest might be logged by now. And it might be too small to support a viable population. Well, at least I tried to do something. Did you?